Greek Festival at Oak Park, 11 am - 7 pm! I went on a Sunday, right smack at 11 am opening time. You may recall some brief rain showers earlier in the morning and maybe that scared some people away, but I wasn't scurrred. I breezed through the normally-insanely-long Greek pastry line, grabbed a mixed box of pastries for $14 and tucked those away for later. I stood in the gyro queue for maybe 2 minutes while the people working there sang something that meant a lot if you were in the know. These were $7 each for a pita with four sizes of gyro meat, onions, tomato and a yogurt-y sauce. 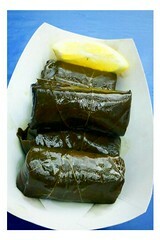 I really enjoyed the dolmathes, which were 5 pieces for $4. Tender, juicy, served with a wedge of lemon to squeeze over the top. Finally, I went back to the pastry queue to get some desserts. 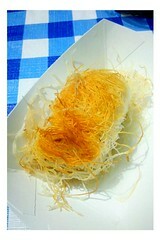 My favorite was the Kataifi, that's phyllo dough that's been finely shredded and rolled, $3 each. The baklava was of course good too, and very drippy and sweet and this is where some handiwipes sure would have been handy.